At 12:20PM Sunday an attentive resident from Fortune's Point (Wintergreen) noticed a fire in the valley below. Crews responded however were initially unable to pinpoint the source. Once access was gained it was determined that power lines to a hunting cabin had blown down sparking a slow moving forest fire. 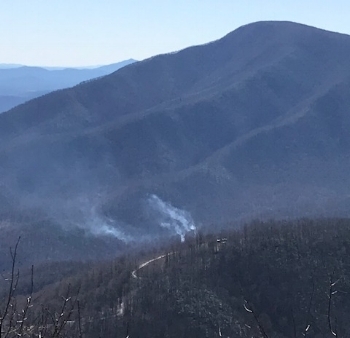 Due to high wind and fire potential, the Virginia Department of Forestry had 14 firefighters staged at Lovingston Fire Department for County-wide deployment. They were dispatched and arrived approximately 30 minutes later. A good team effort kept everything in check and led to a favorable outcome. All Wintergreen owners were notified of the threat using the "Alert Wintergreen" system. If you're a Wintergreen owner and you didn't receive the "Fire Advisory Notice" please contact us to get your into the system or update your contacts. This photo was taken by a "fire-spotter" positioned at the Plunge Park on Blackrock Drive at Wintergreen. Fire and wind conditions were continuously monitored to be certain there was no threat to the Wintergreen community.